Many of us haven’t forgiven Riri for getting back with Chris Brown after allegedly being abused by the R&B singer. However continuing her own abuse cycle isn’t the worst thing Rihanna has ever done. A lot of famous people have bad reputations, some of them are deserved, some aren’t. After reading this article, we think you’ll agree that Rihanna belongs in the former category. You’d think that a public victim of violence wouldn’t advocate the use of weapons. But you would be wrong. Pictured to the right is Rihanna with two of her three gun tattoos. Missing is the holstered revolver inked on her thigh. In a perfect world public figures like her would have higher awareness of their status as a role model. Unfortunately the pop singer doesn’t live in a perfect world and neither do we. But this is only one example of the rude-girl being a terrible role model. Sure Sheen isn’t exactly the strongest example for kids these days. But, that doesn’t mean he isn’t deserving of simple human decency. 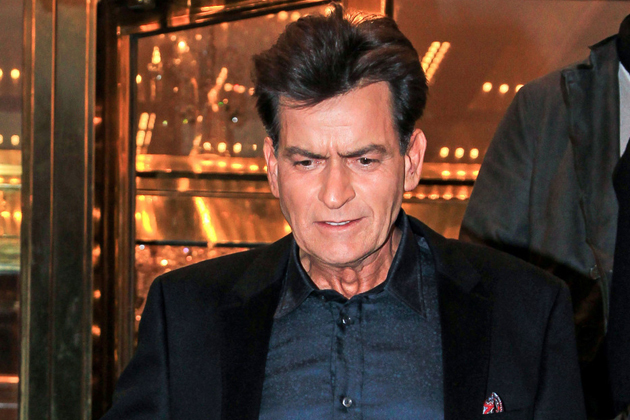 Sheen approached Rihanna at a restaurant for a photo with his fiancée and the popstar. Of course she refused. And, of course this invoked the wrath of everyone’s favorite drug addled actor. Sheen went on a tirade against the singer saying that she should show more respect to her elders. No one ended up “winning” here. In September of last year at a live show scheduled in Australia for her Diamond world tour, the singer showed up forty minutes late to her own concert. This might have been excusable if she hadn’t obviously been very intoxicated. Even that might have been excused if it wasn’t for the lude gestures she made throughout most of her performance. Failing to shine even as bright as a lump of coal, the 26 year old disappointed her fans yet again with the dubious performance. Local reviewer Jillian McHugh summed up the whole affair by saying, “While slurring marked the first half of the show, it was her disinterest in singing along to more than half the words of each song that marked the second half.” Good on ya mate, good on ya. We believe the video below speaks for itself. The picture to the left may bear some explaining. 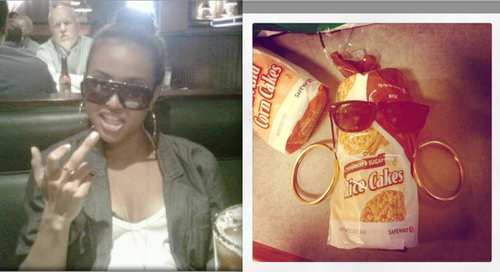 Rihanna posted the image to twitter as an apparent mockery to Chris Brown’s 2012 boo, Karreuche Tran. Tran is of Vietnamese decent and apparently that matters. While Rihanna never made a public statement about the pic and we can’t know for certain if the rice cake was a dig at the staple of Vietnamese diet. However, from where we’re standing it doesn’t seem impossible that Riri would disparage an entire race of people to annoy her ex. This one is probably the most famous. 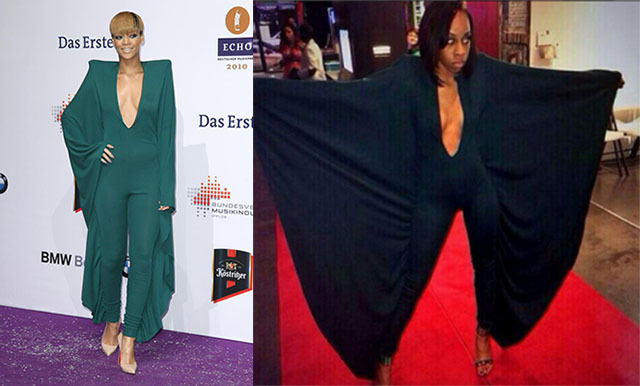 Thing singer decided to make an odd fashion statement on some red carpet with a very deep-V wing suit dress-type thing. A fan of hers was inspired by the strange get-up and made a version of it by hand. This was met with rihanna tweeting the picture to the far right of the 16 year old supporter basically saying the homemade outfit was ugly. Since then Rihanna has been known as a cyberbully. Whether she’s attacking fans in person through her actions, or words Rihanna has the power to revolt even her most fervent supporter. With all of this information about the original rude-girl the only solution seems to be a national boycott of her music. In fact, we can’t think of anyone who deserves it more.